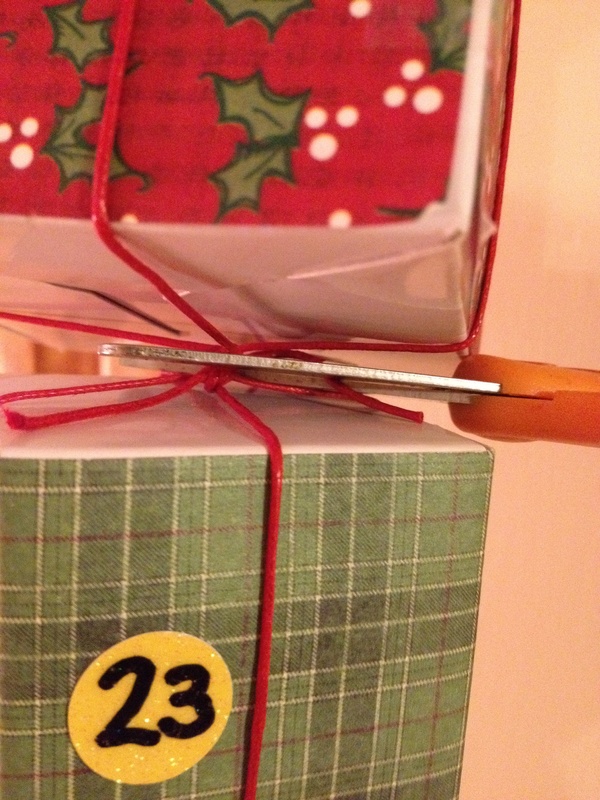 A few years ago, I made this Advent calendar, actually I made two of them -one for each of my boys. They LOVE them. I took the idea from my good friend Martha Stewart who you may have heard of. Ok, so I don’t know Martha Stewart personally, but I do read her magazine on occasion. Anyway, I made them to be reusable, so now we are going into our 3rd year with them. 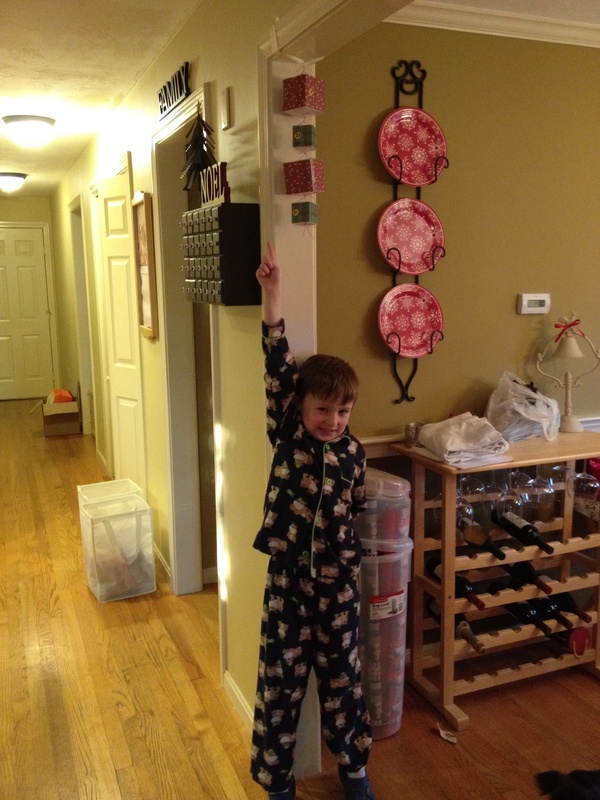 Each of the “calendars” consists of a chain of 24 boxes hung from the ceiling. 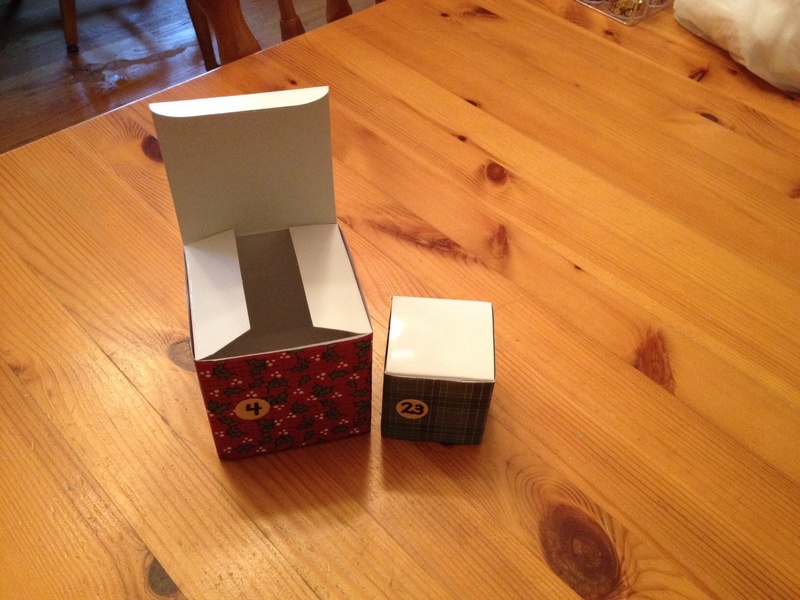 Each box contains a small gift such as a piece of candy, a small toy or a Christmas ornament. I go into crazy-lady shopping mode the last week of November, trying to find teeny-tiny things to fit into the teeny-tiny boxes. But in the end, my kids really do love them, so it’s well worth the effort. 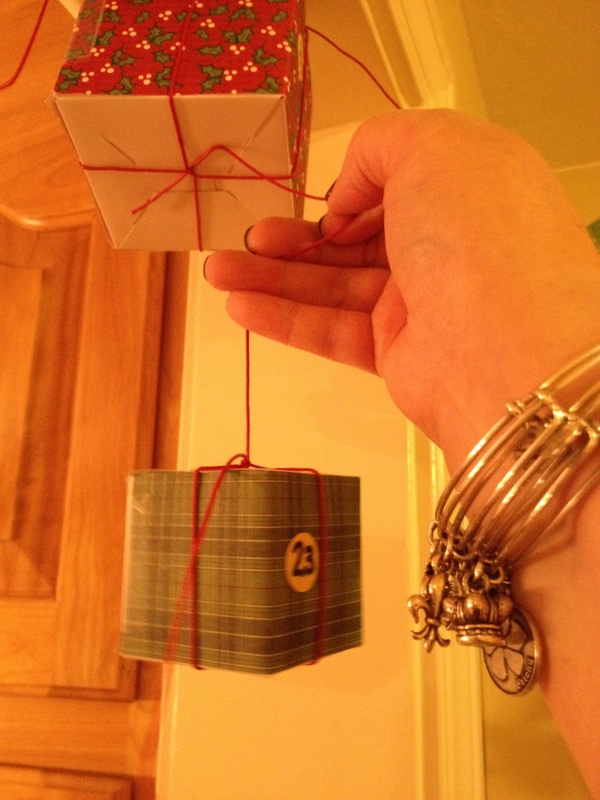 Once filled, the boxes are hung in a chain with number 1 at the bottom and number 24 at the top. 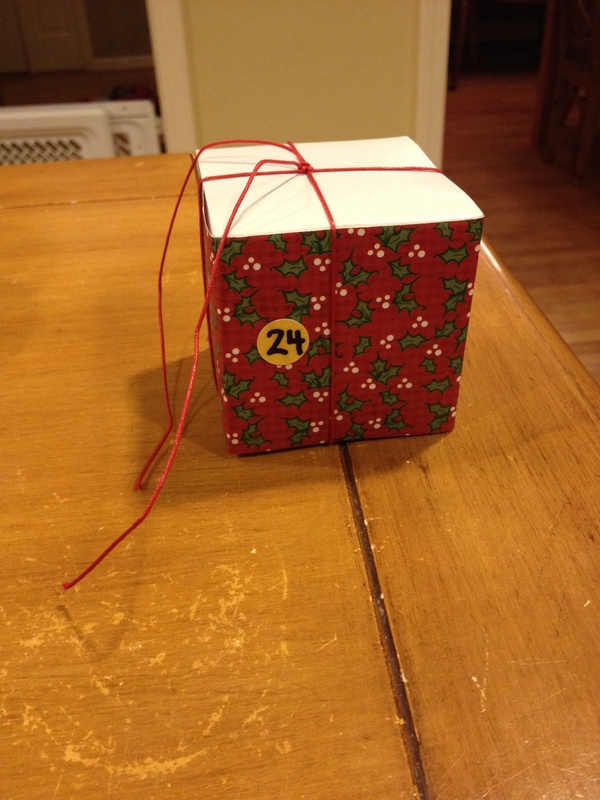 Each day, starting on December 1st, they cut the bottom box off the chain and open it up. On day one, they are laying on the floor to cut, and by Christmas Eve, they need to climb onto a chair to reach the last one. Very, very cute. Once this is done, you can fill up the boxes and shut them all. Keep in mind that they will be opened starting with number 1 and ending with number 24 in case you have a specific sequence you were looking to achieve. Now you will need some strong string to hang your chains. 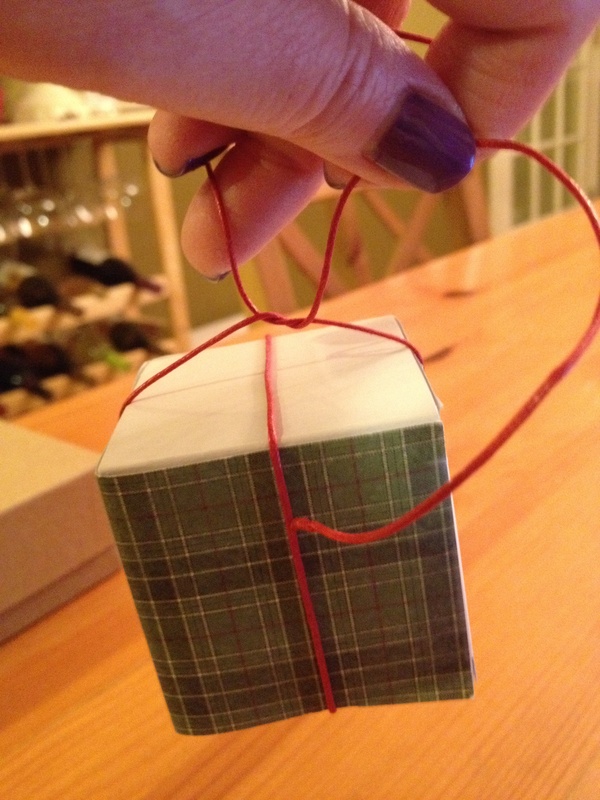 I found some waxed twine in red, which was both strong and pretty, but last year I used red and white striped bakers twine which was nice too. 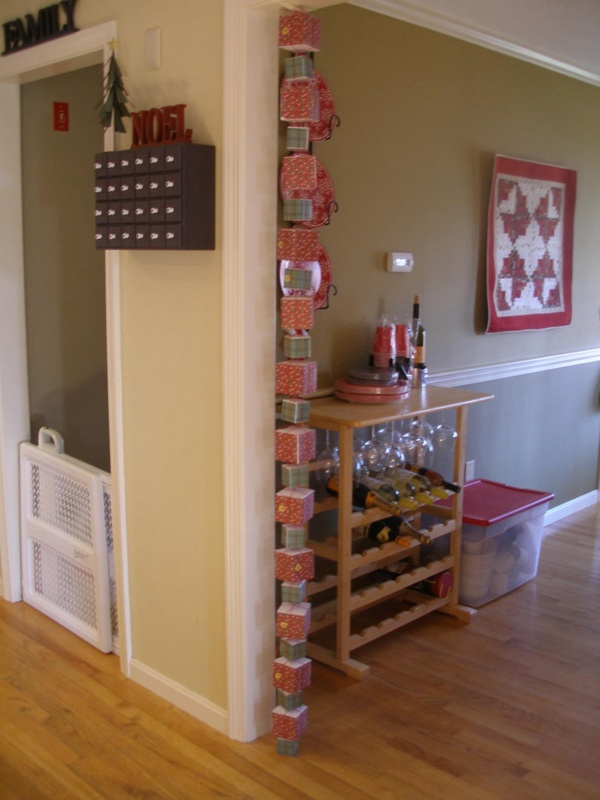 Make sure that your chain of boxes is adequately anchored to the ceiling, since depending on what you’ve got in your boxes, it could get kind of heavy. I hang mine in the doorway between my kitchen and diningroom. 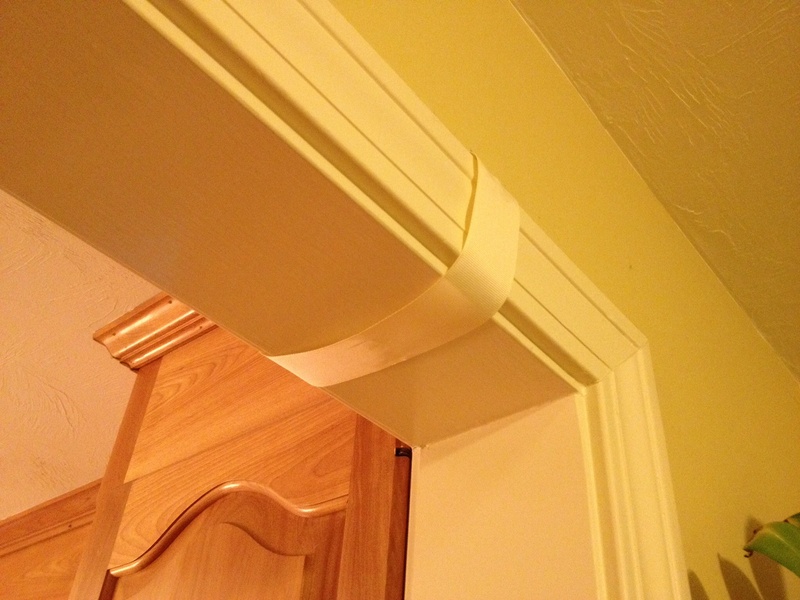 To anchor each, I have a 1-1/2″ piece of grosgrain ribbon that I staple (with a staple gun) to the moulding above the door, both on the inside and the outside. This gives me a loop from which to start hanging my chain. 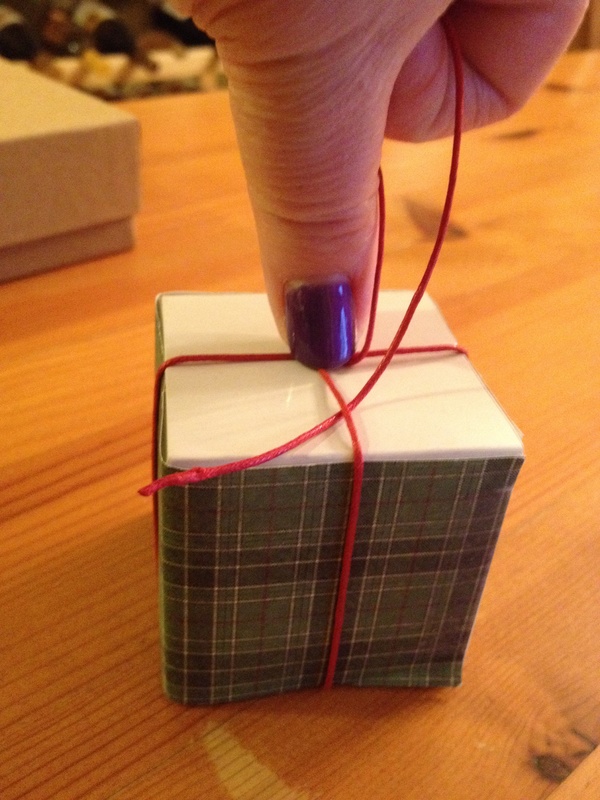 So, starting with box number 24 you need to first tightly wrap your box with string and leave 4 – 6 inches of leftover string above the knot. That gap under the knot is what you don’t want when you’re done. 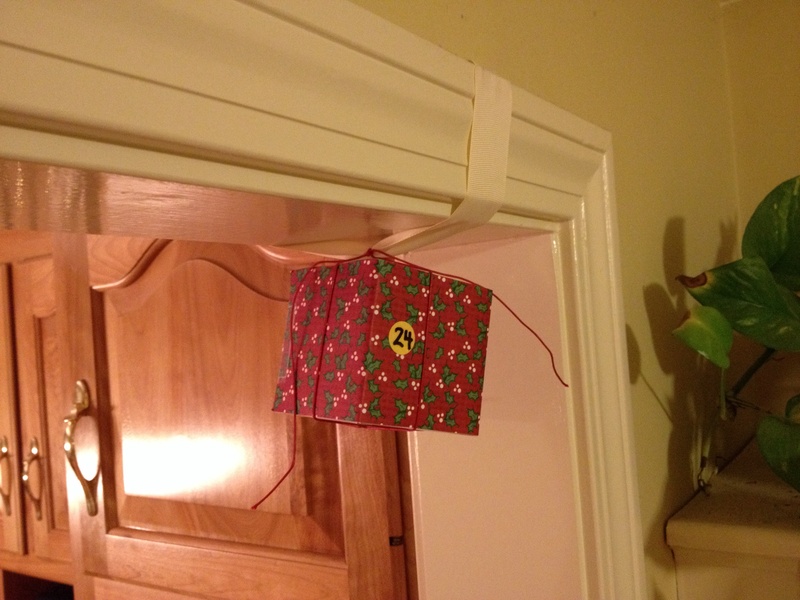 So next, you pass one of the strings underneath the string running across the top of the box. Pull it tight then make one more knot to anchor everything in place. Now, to attach this box to the previous one on your chain, slip one of the strings from this box through the cross on the bottom of the previous one. Pull it tight then double knot it. Cut off most of the leftover strings. Continue building your chain of boxes, counting backwards, one after the other until you end with box number one on the bottom. 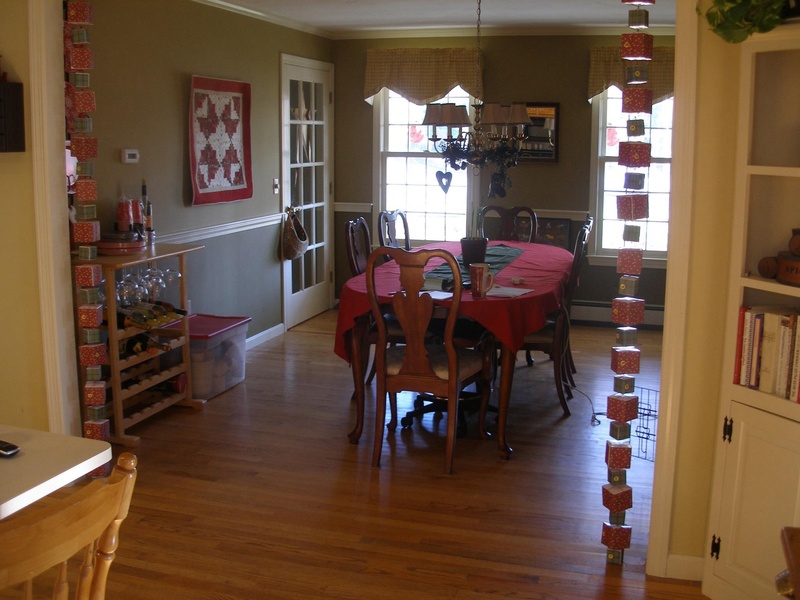 Here are my two chains, one on either side of the doorway. Amazingly, they just fit in the opening with the number one box just resting on the floor. 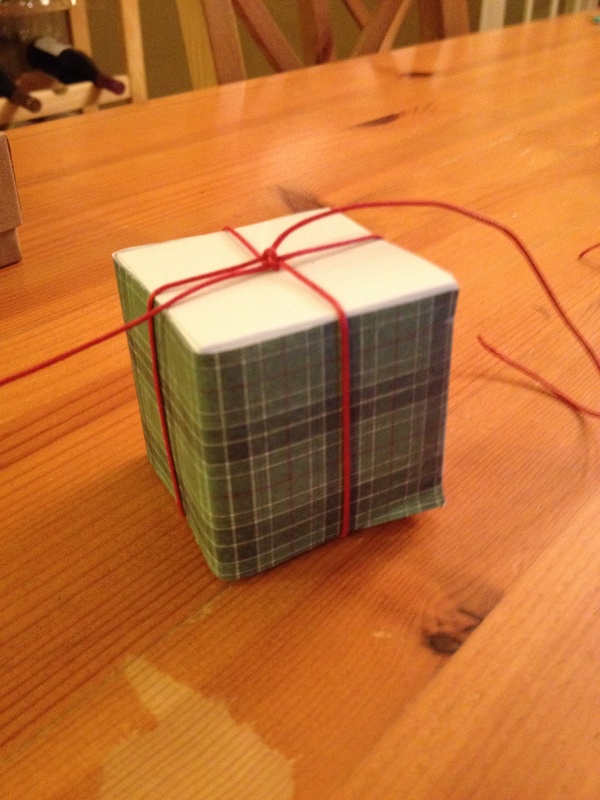 To cut each box off, you want to cut through the knot only. This will ensure that you only cut off the bottom box in the chain. Younger kids might need a little guidance. 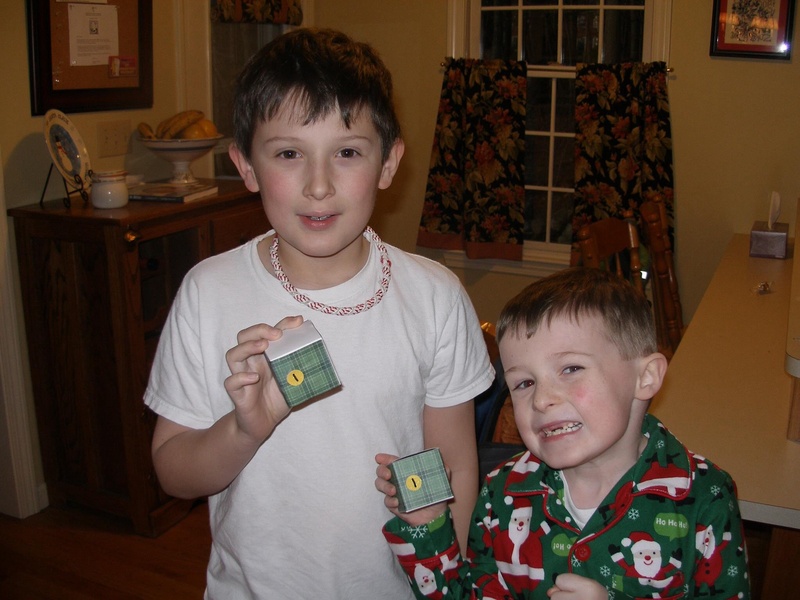 Here are my happy kids on December 1st with their number one boxes. And here is Trevor showing how his chain looks on December 21st. Good luck with your own calendar. If you do it right, save all your boxes and store them carefully, you will be able to use it for many years to come! Posted in Christmas and tagged Advent, Advent calendar, Christmas, Christmas Eve, December 1st, Martha Stewart. Bookmark the permalink.